From the windswept bow of the R/V Laurence M. Gould, I watch as a dozen chinstrap penguins porpoise across the surface of the icy sea. The small black-and-white penguins torpedo along, moving rhythmically back and forth between air and water. Travel made easier. What a remarkable twist of evolution to take advantage of air’s lesser density. As I watch, I’m reminded I’ll soon see the Adélie penguin colonies near Palmer Station, the tiny research station that is home away from home for me along the western Antarctic Peninsula. Adélie colonies on the islands near Palmer Station have become iconic symbols of how human-induced climate change is now threatening the biodiversity of Antarctic seas. Once numbering 15,000 mating pairs, over the past 45 years the populations on these islands have plummeted ninety percent, now a paltry 1,500 pairs. And so it is that even in this remote area of the globe, in seemingly pristine areas so far from human populations, there are clear signs of our impact on the natural world. Though seemingly isolated, Antarctica and the surrounding seas that are home to the Adélie and the krill that feed them are intricately connected to other ecosystems around the world. The salty, cold waters that flow clockwise around Antarctica sink deep in to the ocean, creating a conveyor belt of currents that carry oceanic heat to the ocean basins of the Atlantic, Indian, and Pacific, and collectively influencing the global climate system. As Antarctica is increasingly influenced by climate change so, in turn, are climates elsewhere. Changing ecosystems follow suit, disrupting linkages between predator and prey: Adélies and krill, caribou and grasses; sea lions and anchovies, the list is extensive. We are now in the midst of an extinction crisis, where species are going extinct at rates 1,000 times higher than any time in human history. So what can we do? When it comes to championing global biodiversity, nobody has a deeper commitment to the cause than my friend and colleague, E.O. Wilson. In his recent book Half-Earth, Wilson says that we must understand species populations to understand where we need to protect and manage land and sea for conservation. Every species has a role in the broader ecosystem. Every ecosystem has a place in the natural world. As species increasingly go extinct, ecosystems falter, and the health of our natural world is threatened. Therefore, species are the fundamental level of study that must drive conservation priorities. The Half-Earth Project, led by his Foundation, is doing this work, mapping global biodiversity, helping identify conservation priorities and leading efforts to fill in gaps in information. Last year, my field studies to build our understanding of the Adélie and the Antarctic ecosystem didn’t permit me to attend Half Earth Day held at National the Geographic headquarters in Washington, DC. From all reports, the conference was a stunning success. Scientists and conservationists from around the globe agreed that Ed’s vision for the preservation of half the Earth to ensure sufficient habitat to sustain biodiversity and a heathy planet was both necessary and achievable. Half-Earth has now become a unifying call to action. Lifting my gaze from the departing chinstrap penguins, I make a pact with myself that this year nothing is going to keep me from participating in the upcoming Half-Earth Day in October 2018, where innovative and forward-thinking people will share a common path to a sustainable future. 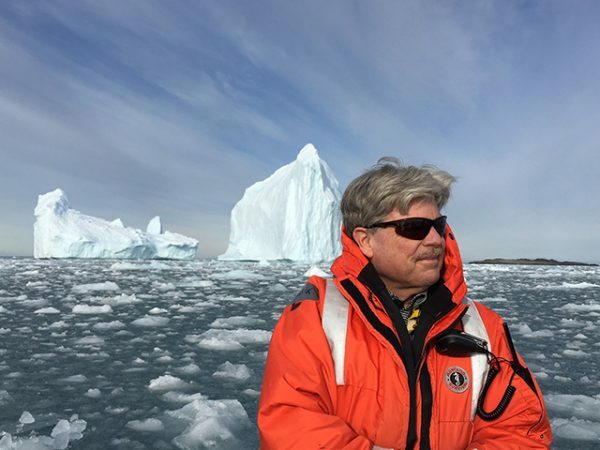 Listen to a recent interview about the effect of climate change on Antarctica with James McClintock on NPR.